Boneless chicken marinated in herbs and spices, grilled in a tandoor and finished in a creamy tomato sauce and fresh cream. Shredded chicken with spicy marinated chicken pieces served with a tomato chili sauce. Chicken prepared in creamy and zesty spices with cashews and coconut cream. Chicken on the bone cooked in curry sauce, simmered with tomatoes, freshly ground spices, herbs and nuts. Chunks of spicy marinated chicken pieces grilled in a tandoor and finished in a creamy tomato sauce. Barbecued skewers of chicken marinated in fresh herbs simmered into curry. 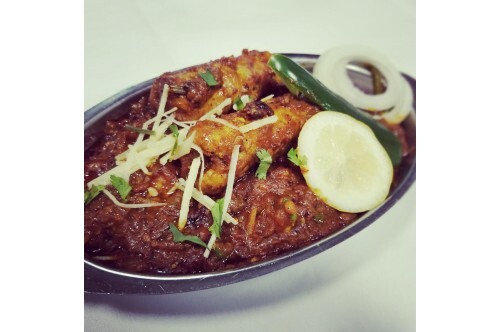 Tender chicken pieces on the bone cooked with fresh tomatoes and Savoy's special Karahi masala.